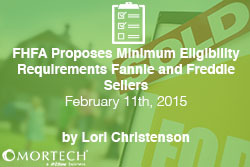 Fannie Mae and Freddie Mac seller/servicers will have to meet new minimum financial eligibility requirements, possibly by the end of 2015. FHFA has proposed minimum financial requirements including net worth requirements for all seller/servicers as well as capital ratio and liquidity criteria for non-depository seller/servicers. All seller/servicers will be expected to comply by the effective date or face action by the Enterprises, including termination. Those in compliance will be reviewed quarterly. The proposal ensures the safe and sound operation of Fannie Mae and Freddie Mae and sets the minimum level of capital and liquidity that would be needed to cover potential losses in servicing Enterprise loans. Feedback will be reviewed in the coming months with implementation effective six months after the requirements are finalized in the second quarter of 2015. FHFA was appointed conservator of Fannie Mae and Freddie Mac in 2008 under the Housing and Economic Recovery Act in response to the rapid deterioration of the housing market and its effect on the Enterprises. The mission of the Enterprises is to provide “liquidity and stability to the mortgage market” and the FHFA is responsible for restoring confidence and enhancing their ability to fulfill the mission. The conservatorship will remain in effect until a safe and solvent condition has been restored.